The Rugii, also Rugians, Rygir, Ulmerugi, or Holmrygir were an East Germanic tribe who migrated from southwest Norway to Pomerania around 100 AD, and from there to the Danube River valley. They were allies of Attila until his death in 453, and settled in what is now Austria after the defeat of the Huns at Nedao in 453. The Chernyakhov culture, or Sântana de Mureș culture, is an archaeological culture that flourished between the 2nd and 5th centuries AD in a wide area of Eastern Europe, specifically in what is now Ukraine, Romania, Moldova and parts of Belarus. The culture is probably the result of a multiethnic cultural mix of the Sarmatian, Slavic, Gothic, and Geto-Dacian populations of the area. Barbaricum is a geographical name used by historical and archaeological experts to refer to the vast area of barbarian-occupied territory that lay, in Roman times, beyond the frontiers or limes of the Roman Empire in North, Central and South Eastern Europe, the "lands lying beyond Roman administrative control but nonetheless a part of the Roman world." In the Late Antiquity it was the Latin name for those tribal territories not occupied by Rome that lay beyond the Rhine and Danube : Ammianus Marcellinus used it, as did Eutropius. 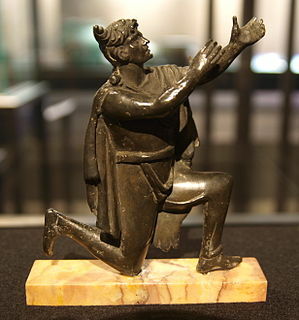 The earliest recorded mention appears to date to the early 3rd century. The Antes or Antae were an early East Slavic tribal polity which existed in the 6th century lower Danube, on the regions around the Don river and northwestern Black Sea region. They are commonly associated with the archaeological Penkovka culture. 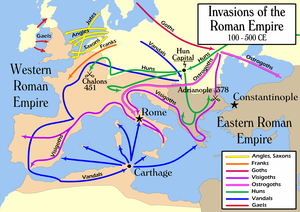 The barbarian kingdoms were Germanic, Hunnic and other kingdoms established all over Europe and North Africa during Late Antiquity, after the fall of the Western Roman Empire. 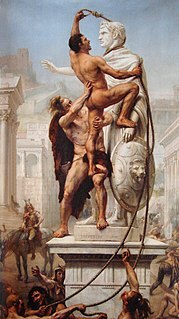 The term "barbarian" has been commonly used by historians even though the term was not used by the peoples in question and carries considerable value judgement. 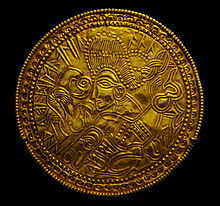 Other terms used include "Germanic kingdoms", "Romano-Germanic kingdoms", and "post-Roman kingdoms".